Carport coops and barns starting at $695.... only 10% Down Payment! Discussion in 'Everything Else' started by HallFamilyFarm, Feb 13, 2012. Don't get caught out in bad weather this spring. Order an American Steel Carport today! American Steel Carports are Engineer Certified Carports! This listing is for an 12' x 21' x 5' (14 gauge) just $695 installed! Prior to choosing the Buy It Now, please read this listing carefully and contact us should you have any questions. DO NOT choose the Buy It Now unless you agree with the terms listed below. Please read the entire listing carefully before choosing the Buy It Now option! ASC are available in most states. Local sales tax does apply. Invoice of sale must be signed and returned to dealer, Jims Farm Stand, with at least a 10% down payment. Invoice of sale must be accepted by American Steel Carports, Inc. Contact us for more information about other sizes. 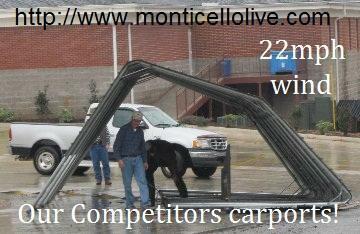 The photo of the our competitors damaged carport was taken on February 1, 2011. ASC will provide a 90mph wind warranty for FREE! Note: Jim's Farm Stand is an authorized dealer for American Steel Carports, Inc and is located in Monticello, Arkansas. It is the responsibility of the buyer to check with his or her own code enforcement to see if our carports meet your local code. You will also need to check your local tax code to figure what the sales tax cost will be. The sales tax is based on your local tax code. We have added a copy of the ASC Invoice of Sale in our photos and on our website. ASC delivers and installs all ASC carports and buildings as a part of the purchase price. This is not a kit. ASC does not provide discounts for drop shipping and self-installation. If you choose the Buy It Now and do not live in the states listed above, the actual delivered price may be different. Choosing the Buy It Now makes the sale final and (you) the buyer agrees to pay the difference upon delivery. Choosing the Buy It Now, buyer agrees to complete the required invoice within 24 hours. Buyer understands that ASC cannot accept this purchase without a signed invoice. Jim's Farm Stand does not provide refunds! Choosing the Buy It Now, the buyer acknowledges that there will be NO REFUND of the down payment! DO NOT choose the Buy It Now unless you agree with these terms! If you desire a different size than listed, or live outside the states listed above, Jim's Farm Stand can set up a new listing just for you. We are able to give a quote for almost any State. Just send us an email with your location and size unit. Thank you for choosing Jim's Farm Stand! Note: They are using a different type structure, but the concept is the same. With ASC you would have at least a 5' sidewall. For a small fee an all steel floor frame can also be installed. A friend in Mississippi authorized us to use his photos of his carport coop. Really neat what they did with a carport.